Facelift and neck lifts can correct the toll taken on our faces due to factors such as gravity, sun exposure, and the stresses of daily life. Deep creases that appear beside the mouth can be corrected by having a facelift. A facelift can also correct a jaw line that slackens and a neck lift can eliminate folds and fat deposits that appear on the neck. Facelift and neck lifts can counteract these trouble spots by removing fat and tightening skin and muscles. 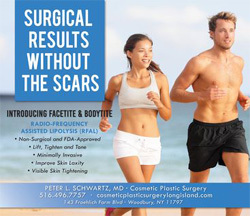 A facelift performed by Dr. Peter L. Schwartz at his Woodbury, Long Island Cosmetic Plastic Surgery facility can give your face a fresher, more youthful look. After facelift surgery, some patients have been known to appear as much as 10 to 15 years younger. The facelift (rhytidectomy) procedure works best when it is combined with other cosmetic plastic surgery procedures such as the brow lift, eyelid surgery, nose reshaping and the neck lift procedure. A neck lift combined with a facelift together can create even more dramatic results. During a facelift, small incisions are made in inconspicuous places such as behind the hairline and in natural folds of the face and ears. Scars made as the result of a facelift or neck lift fade to near invisibility with time. Before undergoing a facelift, it is important to understand that the results of a facelift do not last forever. Depending on how well you take care of your skin you may want to have another facelift procedure done in five to ten years. If the signs of aging in your face are bothering you, a facelift may be a viable option for you. If you re considering having a facelift procedure done, call Dr. Schwartz and he will outline all of the viable options during a complimentary cosmetic plastic surgery consultation. The technical term for a facelift is a rhytidectomy. The facelift cosmetic surgical procedure aims to improve visible signs of aging in the face and neck. Some common signs that may cause you to consider face lift cosmetic plastic surgery include skin that sags, deep creases below the lower eyelids, deep creases along the nose extending to the corner of the mouth and fat deposits that have fallen or have become displaced. A common issue that people contemplating a face lift have is the appearance of jowls due to loss of muscle tone in the lower face. Jowls refer to the loose skin or folds of fatty flesh under the chin and around the cheeks or lower jaw. Loose skin and excess fatty deposits under the chin and jaw can make even a person appear top have a double chin. A facelift can eliminate jowls and give patients a rejuvenated look. Dr. Schwartz will take ample time to discuss your candidacy for blepharoplasty, or any other facial plastic surgery, and answer the questions you may have. To learn more, contact us today. Looking for a Plastic Surgeon? Contact our office to schedule your free consultation and begin your journey toward achieving the look you want. FaceTite - less invasive way to eliminate droopy skin. Transform Yourself with a Mommy Makeover. The abdominoplasty isn't a weight loss surgery or a alternate for diet and exercise.